Thank you all who came to last nights Meet-up. Great sharing seeds with you all and exchanging thoughts. Here is a recap for those who couldn’t attend. Saving seeds is ever more important now that companies like Monsanto are messing with nature in a way that is new to the planet. Companies are now Genetically Modifying the Organisms we EAT! For those who are unclear as to what GMOs are, let me explain. A GMO happens when you take a gene from one organism (a bacteria) and place it into another organism (plants we eat). Now the scary part is why companies are doing this. Traditionally we spray chemicals (Bt) onto a plants to kill the bugs who want to eat it. The problem with that is when it rains or they water the plants, the chemicals wash off. To “fix” this problem they now grow the plant with the toxins (Bt) built into their DNA to ensure every part of the plant has poison that cannot be washed off. Does this sound safe? In permaculture we strive use our own heirloom varieties to build up the best stock of plants for our environment. When you save your seeds from your best plants you are ensuring the survival of the fittest but on a much quicker pace. Your plants now have formed their own best DNA structure and have done it the way that nature had attended. Another reason we should save seeds is to save some money. This doesn’t seem like a huge expense but over time it adds up. Think about the farmers that cannot save their seeds and need to buy new seeds every year, that’s a big expense. When farmers don’t buy the Frankenstein seeds companies like Monsanto sue these farmers and cause them to lose everything. 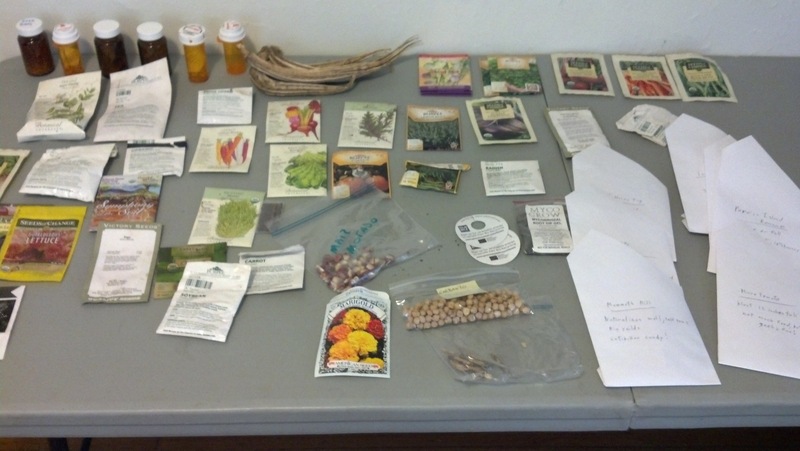 The funnest reason to save seeds is sharing with your neighbors and building community. 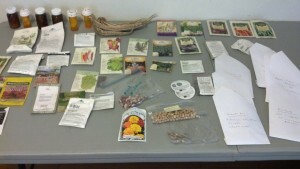 Seed exchanges allow you to broaden your variety of plants you can grow and helps your neighbors do the same. If we all grew the same stuff we wouldn’t have much need to share and would be very limited in what foods we produce. It’s important to plant a well diverse crop to ensure a healthy garden or backyard and permaculture hlps puts it all into place. Once you have your seeds you will need to make sure you store them correctly. It’s ok to keep them in the envelopes they came in but a re-sealable storage bag works best. It’s important to keep them sealed, dark and cool. Also make sure you document as much as you can about the seeds and when they were saved. Now that you have some good base knowledge of seeds please start building your own bank or come on down and share with mine. There is a Revolution going on and we need to ban together and fight the systems controlling us. The movement of the seeds and the carcnikg of the soil inside the container is likely from watering and drying cycles in the container. The soil in a container, also, will become compacted. It is better to use soil with perlite or vermiculite to keep the soil aerated and make better use of water. The container needs to be well drained, as well, sitting in a dish or a tray for example.If you do that, or, have it self-watering, the depth of soil can be less than proscribed for soil depth for planting in the garden. In fact, many things may do better in a container than in the garden.Mint, for example, likes a container.I use containers for plants I want to keep away from bug pests or disease. Other than that, I use companion planting.